The theatre was designed by Edward Stone. The theatre opened on the 29th of September 1930 with "The Way to Treat a Woman" by Walter Hackett. It was originally called The Whitehall Theatre, until 2004 when the theatre was reconfigured into two studios and renamed The Trafalgar Studios. The Theatre is currently owned by the Ambassador Theatre Group. It is also known as Trafalgar Studios at the Whitehall Theatre in honour of its former incarnation, the building consists of two intimate theatres designed by architects Tim Foster and John Muir. Studio 1, the larger of the two spaces with 380 seats, opened on June 3, 2004 with the Royal Shakespeare Company's production of Othello. Studio 2, with 100 seats, opened in October 2005 with the play Cyprus. The closest tube stations are Embankment and Charing Cross. The closest train station is Charing Cross. The venue is located in central London so it is advised to use public transport where possible. Bus numbers 3, 11, 12, 24, 53, 77a, 88, 91, 139, 159 and 453. There is a NCP car park in Bedfordbury. 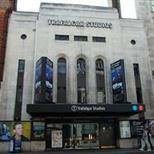 Trafalgar Studios 1 & 2 are accessible for Wheelchair Users. The main entrance to the theatre is on Whitehall. The Foyer, Foyer Bar and Box Office are on street level. For Studio 1 you can enter the foyer step free, take the lift to the lower level then a stair lift brings you to the front of the auditorium. The Wheelchair Spaces are in the front row and are clear view. For Studio 2 access is step free into the foyer, take the lift to the lower level then there is level access into the auditorium. The Wheelchair space is again in the front row & clear view. If Wheelchair Patrons would rather transfer into a seat then the wheelchair can be stored during the performance and brought back to you at the end of the show. For disabled bookings and information please call 0844 871 7677. Sennheiser Infra-red and Induction Loop sound amplification systems are in use in both Studio 1 & 2; for Studio 1 you will need to be seated between Row F and Row K and between seat numbers 5 and 26 for best reception. For Studio 2 A7-8, B10-11 or C11-16 are best. Guide Dogs are permitted in the auditorium or can be looked after by the venue staff during the show. For more access information and to book please call 0844 871 7677.